Your business network needs a few critical components: Speed, Security, and Data Backup. There was a time when backing up your files was a safety net to catch you in the event of an erroneous file deletion, inexplicable file corruption, or hardware failure. In the era of Ransomware, having a data backup may be the only option to paying the ransom. You have done all the right things. You have a server to centralize your files. You use updated antivirus software. You have a local backup solution, and an offsite backup solution. Right? Maybe. You may want to verify that your backups are running, current, and that the files can actually be restored. Sadly, regardless of how current your network firewall, anti-virus software, or behavioral policies are, the bad guys are outpacing the good guys. Well-funded and state-sponsored actors are using advanced tactics such as brute force attacks, poisoned web pages, and phishing scams to lock your files with undecipherable encryption. Once your files are encrypted (and no longer accessible by you) you are presented with a message that explains how to use Bitcoin to buy them back. It sounds crazy, but it is very real. With regard to ransomware, the rule of thumb is never pay the ransom, but the rule of thumb only applies if you have a data backup. In the worst case scenario, you have no backup of your files, you cannot or will not pay the ransom, and all of your files are lost forever. In the best case scenario, you have the ability to restore your computer from a full and recent backup. You may be down for a day, but you're not out of business. 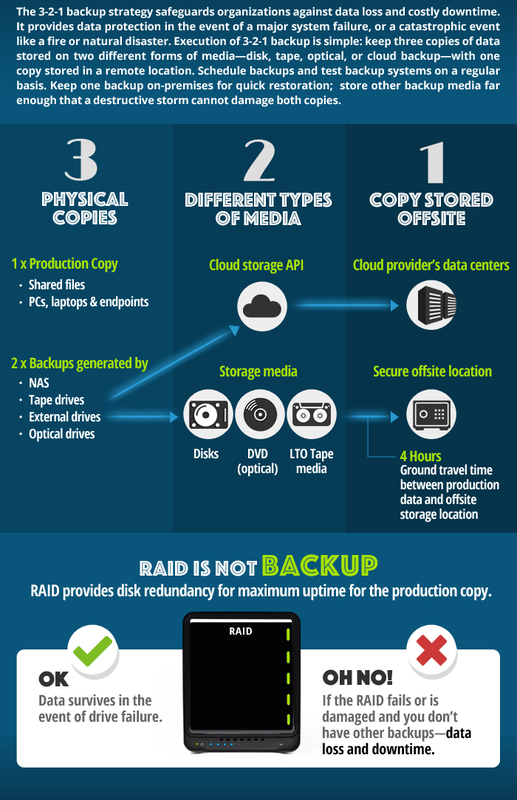 Ideally, you have a 3-2-1 backup strategy as shown in the infographic below as 3 Physical Copies, 2 Types of Media, and 1 Offsite Copy. The good news is that this type of solution is extremely affordable. How affordable? Less than $200 in hardware and $100 per year! If you have questions, we have answers. We have over 25 years of experience with data backup. We can help you with basic solutions as well as advanced solutions like Dell AppAssure.